Home On Location Blencathra’s best. With an appointment in Keswick arranged for mid-morning on Wednesday I planned to use the full day to enjoy the predicted decent weather forecast. So an early rise was called for and it was just before 4am as we headed west along the A66. The clear frosty morning wasn’t to be and as I headed down over the Stainmore pass the cloud cover was extensive over the lakeland fells. Undeterred I stuck to my original plan and pulled up at Castlerigg with not a hint of a decent sunrise. With time to spare a short walk to the stone circle was almost done without the camera, I was glad that I stuck to my habit, the light wasn’t brilliant but the local residents were up with the larks. The ancient stones were now the playground of lambs and even with Bailey by my side they carried on with their antics. Sometimes unexpected opportunities arise which cannot be planned- this time I was lucky. The lambs soon dispersed and for a brief moment of less than a minute the early low sun broke through but I knew I already had my shot of the day in the bag. After a great meeting at Keswick Museum I drove to Threlkeld to act on my second plan for the day. Blencathra is a fell to which I have devoted quite a bit of time for the project which has resulted in me ascending it several times over the past few years, exploring the ridges, gullies and places off the beaten track. Today was different, no seeking out references, just a walk for pure pleasure. Of all the routes, Sharp Edge included, the best route to the summit in my opinion must be via the Halls Fell ridge and in fact Wainwright wrote “For active walkers and scramblers, this route is positively the finest way to any mountain-top in the district.”, and that was my route for the day. It was after 12 when we set off and the sun was breaking through the dispersing clouds. Bailey and I were soon on the lower slopes and behind us the valley with the richness of the spring grasses in the pastures making a patchwork of emerald. It’s a ridge which leads directly to the summit and the topmost section provides some enjoyable hands on scrambling. Maybe not quite as airy as Sharp Edge but longer and quieter and if you keep to the spine of the arete, you will get plenty of excitement. Some sections have an easier path away from the crest but at times the narrow edge cannot be avoided. Looking down the ridge from the summit. Before you know it you will complete the ridge and almost trip over the concrete survey ring which marks the fells highest point, often to the surprise to those who have taken the easier ascents. Today we were alone, the advantage of a mid-week visit. We stood for a few minutes and admired the aspect to the south with many of the lakeland fells in full view. Taken a faint path northwards to Foule Crag we crossed the dip between the two points that give Blencathra its alternative name of Saddleback. There in the dip is a shallow pool, unnamed as a tarn on maps as possibly it doesn’t qualify as it has neither an obvious inlet or outlet. No matter, it was mirror-like today as the air was almost still. The cairn has increased in size since I saw it first some years ago. Bailey took the opportunity to quench his thirst before we moved on to Foule Crag. From here there is a great view over the flat lands of Mungrisedale Common to the rounded slopes of many of the northern fells and the Solway Firth and the hills of Dumfries and Galloway beyond. Mungrisedale Common is assured of a good mention in my book, including my theory as to why AW included it in the fifth Pictorial Guide. A short walk east took us to the aerial view of Sharp Edge. Today it was quiet, in fact the whole of the fell was quiet, in my time spent wandering around the summit of the fell I only encountered 4 other walkers. Soon it was time to consider my descent back to Threlkeld. I had already plotted my route, the fine ridge of Gategill Fell would lead me straight back to the village. The path along the height of Blencathra provides stunning views southwards over the deep gullies of the fell. Clouds were forming patches of sunlight on the fell side and for a brief moment Halls Fell ridge, our route of ascent was dramatically illuminated. Halls Fell Ridge. The view of Gategill Fell from above shows it as a fine ridge for descent, steep and loose at the start it soon eases to a grassy promenade until the point known as Knott Halloo. After that rocky outcrop the fell drops away steeply and a narrow path through the heather took us down to the car park behind Threlkeld. I know many people aim to reach Blencathra summit by crossing Sharp Edge. Consequently that route can be over-crowded and congested. There is more to this fell than that one route, check out these ridges of Halls Fell or Gategill Fell, you will not be disappointed. 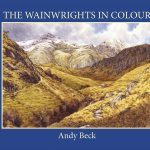 *Please note: Whilst I complete the Wainwrights in Colour project I will endeavour to publish these reports as time allows. However, I do have plans already in place to catch up with all of my backlog of outings and post them on a new website complete with some exciting features which will be unique to my website, so watch this space. Blencathra- curing the artist’s block.